4.2 out of 5 based on 17 bloggers and 2 commenters. 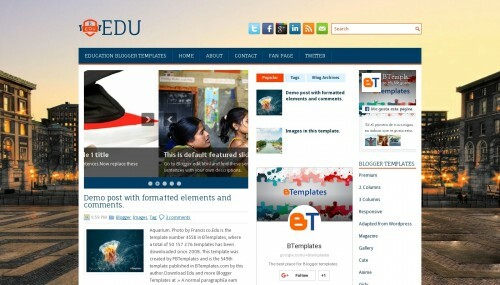 Edu is a free blogger template adapted from WordPress with 3 columns, right sidebar, footer columns, slider, social bookmarking icons, posts thumbnails, tabs and breadcrumbs. Excellent template for blogs about education or news. This is beautiful. Thanks for this, I just installed this theme on our ministry’s blog. It looks great!